There’s no better way to start racing than to build your own FPV quadcopter. 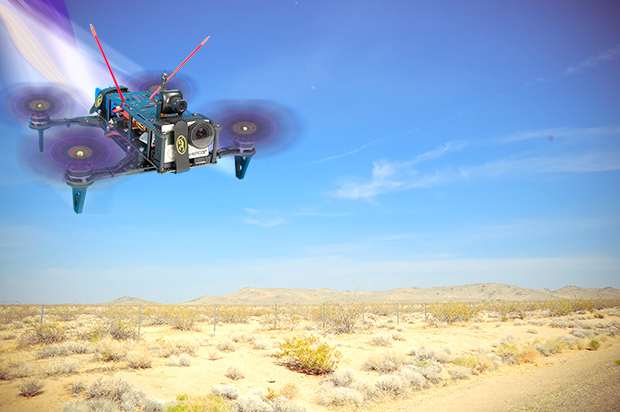 Ready to jump into the world of first-person-view (FPV) drone racing? Building your own mini quad is a good way to get your first rig while learning the fundamentals of multirotor flight and piloting, as well as brushing up on your electronics and soldering skills. A quadcopter is the most common configuration and is widely supported by airframes tailored to racing, which require extra durability during crashes. This build is based on the Hovership (which can be purchased or downloaded and 3D printed from hovership.com), but is applicable to many FPV racers. Attach the arms of the frame to the center base plates. Mount the power distribution board to the center of the baseplate using double-sided foam tape or nylon screws. Place 2 speed controllers on each side of the power distribution board. Attach a motor to each arm. Solder the red and black 14AWG silicone wires to the primary power input pads of the power distribution board. Cut the primary power leads to about 130mm or longer. (The length will depend on where you attach the battery.) Cut 2 pieces of 6mm heat-shrink tubing and slide them down each power lead. Solder the power leads to their corresponding sides of the battery connector. Slide the tubing up to the battery connector and shrink them to cover the exposed solder connections. Solder the red (positive) wires from the electronic speed controller (ESC) to the corresponding pads of the power distribution board. Repeat for the black (negative) wires. If your motors and ESCs did not come with connectors presoldered, it is recommended that you do so; this will make it easier to replace a component in the future, if necessary. Trim the motor or ESC wires to length, leaving some slack, and use a wire stripper to expose the wire inside. Solder the wire into the gold bullet connectors. Male connectors should be placed on the motors, female connectors on the ESCs. Cover each connector in 4mm heat-shrink tubing. CAUTION: If your frame is made from carbon fiber, which conducts electricity, any exposed connections touching the frame will cause shorts in the electronics. If your frame has an additional plate be-tween the ESCs and the flight controller, assemble this part now. Feed the servo cables through to the center of the frame where the flight controller will be mounted. Before mounting your flight controller, you will need to determine which ESC plugs into the correct motor output of your flight controller. 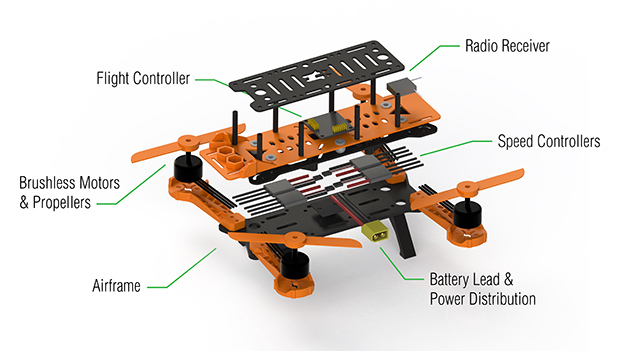 Consult the flight controller documentation for the order of an X-quad layout. Once the ESCs are connected, attach the flight controller to the frame. If your frame has a specific side that is the front (look for an arrow), your flight controller’s front should be pointed in the same direction. Consult your flight controller’s documentation for the wiring between the radio receiver and flight board. Secure any loose wires or components with cable ties. Assemble any remaining frame parts such as the top plate or camera mounts. Turn the transmitter on, move the throttle stick all the way up. Connect power from the battery to the quad. The ESC will make a series of beeps when powered on. After the tones complete, lower the throttle. The ESC will make another series of beeps confirming the calibration. Place a propeller on the motor you calibrated but DO NOT secure it. Slowly raise the throttle until the motor starts to spin. You will be able to see which direction the motor is spinning and can now lower the throttle. Consult your flight controller documentation to verify the motor is spinning in the correct direction. If it’s not, unplug the battery and swap 2 of the connections between the motor and ESC to reverse the motor rotation. Repeat for the remaining 3 motors. Most flight controllers come preprogram-med for an X-quad layout. If yours does not, you will need to configure it over USB or onboard controls, depending on the flight controller. For beginner pilots, it is recommended that you verify that the default flight mode is attitude/stabilized/auto-level. The flight controller’s configuration software will also allow you to confirm that all the radio channel inputs are in the correct order or if any need to be reversed. Charge your battery and attach the propellers to the correct motors. Your first test flight should be used to verify that all components have been properly configured. Slowly raise the throttle until the quad almost leaves the ground. If it shakes while hovering you will need to reduce some gains in the PID tuning. Move the right stick up (elevator), the quad should pitch forward. Move the right stick left (aileron), the quad should pitch to the left. Move the left stick to the left (rudder), the quad should rotate counterclockwise. Steve Doll is the founder and lead designer of Hovership. He has been building and flying multirotor helicopters for 4-plus years and enjoys creating aerial photos and videos. Build this project and more in Make: Vol. 44.